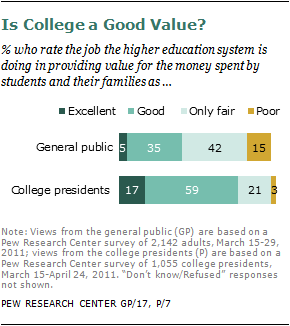 A majority of Americans (57%) say the higher education system in the United States fails to provide good value for the money students and their families spend, and about four-in-ten college presidents say the system is headed in the wrong direction, according to a pair of new nationwide surveys—one of the general public; the other of college presidents—conducted by the Pew Research Center. At a time when sharply rising student debt burdens have touched off a national debate about the cost and value of a college education, the public survey shows that fewer than one-in-four Americans (22%) believe that most people today can afford to pay for a college education, down from 39% who felt this way a quarter of a century ago. College presidents are not as concerned as the public about affordability, but their survey responses reveal broad misgivings about quality and standards—both of the institutions themselves and of the students attending them. 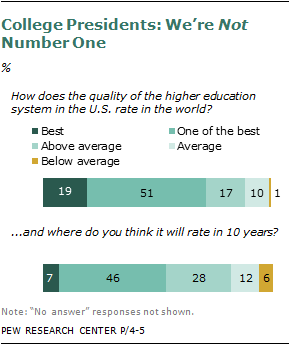 For example, just 19% of the 1,055 college presidents surveyed say they believe that the U.S. system of higher education is the best in the world. And just 7% say they think it will be the best in the world 10 years from now. In addition, most college presidents (52%) say college students today study less than their predecessors did a decade ago, while just 7% say they study more. And 58% say that public high schools are doing a worse job of preparing students for college now than they did a decade ago, while just 6% say they are doing a better job. Not all findings from the two surveys are downbeat. While a minority of the public says students get excellent (5%) or good (35%) value for the money they and their families spend on college, an overwhelming majority of the college graduates surveyed—86%—say that college has been a good investment for them personally. Moreover, the survey shows that the public has a keen awareness of the substantial earnings dividend that college graduates enjoy in their working lives. In response to a survey question, adults with a college degree estimated, on average, that they earn $20,000 a year more by virtue of having gotten that degree. 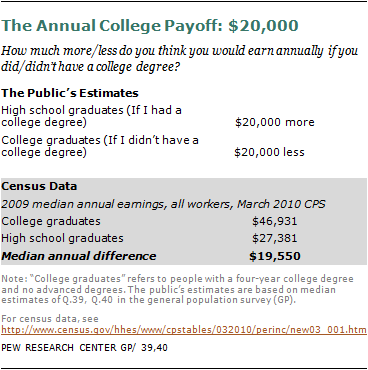 Likewise, the survey finds, adults with only a high school diploma believe, on average, they earn $20,000 a year less as a result. These mirror-image estimates are not only in sync with each other, they’re spot on with the relevant government data. According to 2010 Census Bureau data, the gap in median annual earnings between a worker with a high school diploma and one with a college degree is $19,550. According to a Pew Research analysis of census data, over the course of a forty-year working life, the typical college graduate earns an estimated $550,000 more than the typical high school graduate, even after factoring in the costs and foregone earnings associated with going to college. Beyond these dollars-and-cents evaluations, the Pew Research survey finds that college graduates, on average, are happier and more satisfied with their jobs, their financial situation and their education than are those who did not attend college. It also finds that most graduates say that their college education was very useful in helping them grow intellectually (74%), mature as a person (69%) and prepare for a job or career (55%). 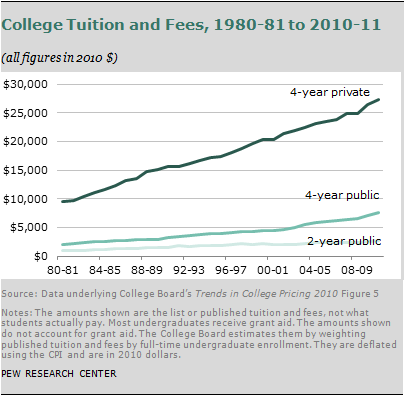 College remains a near universal aspiration in this country, even in the face of steeply rising costs. Among parents of a child ages 17 or younger, fully 94% say they expect their child (or children) to attend college. But the survey also finds that while Americans place considerable stock in the value of college, they see character traits, not education, as the most important determinants of success in life. 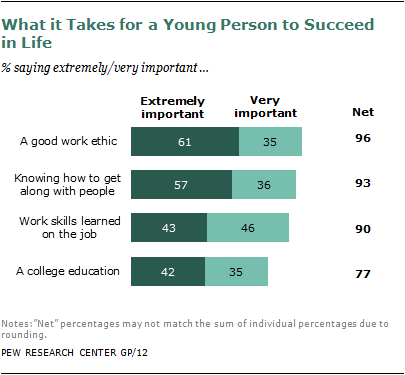 When asked what it takes for a young person to succeed in the world, more people point to traits such as a good work ethic (61% say this is extremely important) and knowing how to get along with people (57%) than say the same about a college education (42%). The pair of Pew Research surveys were conducted at a time when the cost of a college education—at both public and private institutions—has roughly tripled since 1980 in inflation-adjusted dollars; when more students than ever are borrowing to finance their educations; and when the typical student who graduates from a four-year college with an outstanding loan starts out with a record balance of $23,000. The survey of the general public was conducted by landline and cellular telephone from March 15 to 29, 2011, among a nationally representative sample of 2,142 adults living in the continental United States. A separate online survey of college presidents, by the Pew Research Center in association with the Chronicle of Higher Education, was conducted from March 15 through April 24, 2011, among the leaders of 1,055 two-year and four-year private, public, and for-profit colleges and universities with 500 or more students enrolled. Who Should Pay for College? 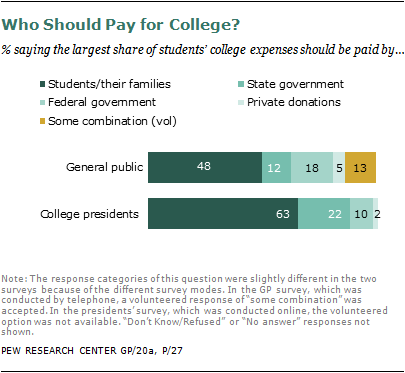 Nearly two-thirds of college presidents (63%) say students or their families should pay the largest share of the cost of a college education; just 48% of the general public agrees. Among the public, a significant minority would prefer that the main burden be carried either by the federal government (18%), states (12%), private donations and endowments (5%) or some combination (13%). The demographic groups least likely to say that the main cost of college should be borne by students and their families include blacks, Hispanics, young adults and low-income adults. Most Americans Say College Students Don’t Get Good Value for the Money They and Their Family Spend… Just 5% of the public says college students receive excellent value for the money they and their families spend; some 35% say they receive good value; 42% say only fair; and 15% say poor. Views on this question are similar among those who attended college and those who did not. However, college presidents have a different view. More than three-quarters say students receive excellent (17%) or good (59%) value for the money they and their families spend on higher education. Heads of public four-year colleges are more upbeat about the cost/value trade-off (32% say it is excellent) than are heads of private four-year colleges (17% excellent). 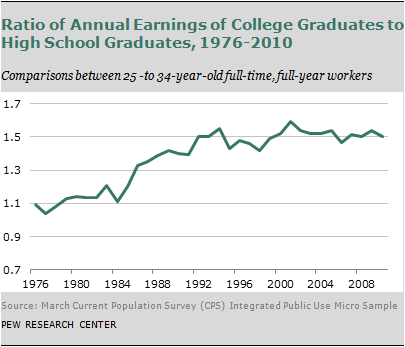 …But College Graduates Say It’s Been a Good Investment for Them. 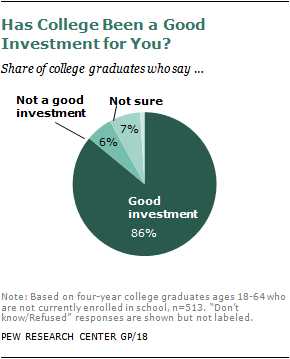 Among the college graduates who took the general public survey, fully 86% say that college has been a good investment for them personally; just 6% say it hasn’t; and 7% say they aren’t sure. Likewise, among the 212 survey respondents who are currently enrolled in college, 84% say they expect that the investment they and their family are making will prove to be a good one for them personally. Growing Concerns about Affordability. 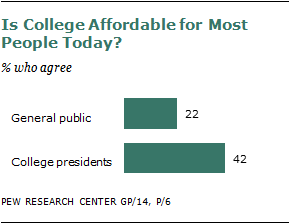 Three-quarters of the public say most people cannot afford to pay for a college education. In 1985, just six-in-ten Americans felt this way.1 A slight majority of college presidents—57%—agree that the cost of college today is such that most people are unable to afford it. The Burdens of Student Debt. 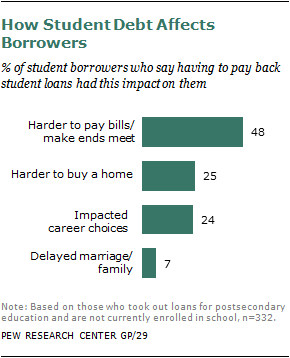 Among all survey respondents who took out college loans and are no longer in school, about half (48%) say that paying back the loan has made it harder to make ends meet; 25% say it has made it harder to buy a home; 24% say it has had an impact on the kind of career they are pursuing; and 7% say it has delayed their getting married or starting a family. Mixed Views about the Direction of Higher Education. 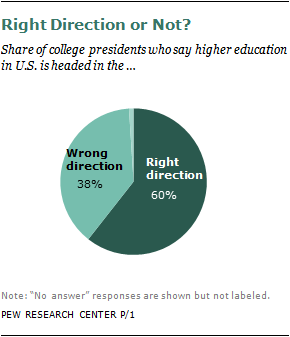 Six-in-ten college presidents (60%) say the system of higher education in the United States is going in the right direction, but a substantial minority—38%—say it’s headed in the wrong direction. Also, just 9% of college presidents say the higher education system is doing an excellent job of providing academic programs that meet the needs of today’s economy; 67% say it is doing a good job; 22% say only fair; and 1% say poor. College Presidents See Declining Student Quality. About six-in-ten college presidents (58%) say high schools are doing a worse job now than 10 years ago in preparing students for college; just 6% say they are doing a better job. Also, 52% of college presidents say college students study less now than they did 10 years ago; just 7% say they study more. About All those A’s. Some 27% of college presidents say that, at their own institution, the faculty grades students too leniently; 1% say they grade too stringently; and 73% say they grade students about right. Doubts about President Obama’s College Completion Goals. Nearly two-thirds (64%) of college presidents say it is unlikely that, by 2020, the U.S. will achieve the goal set by President Obama to have the highest share of young adults with a college degree or certificate of any country in the world. Not Much Support for Faculty Tenure. The long-standing academic tradition of faculty tenure ( lifetime job security as a means of ensuring academic freedom) doesn’t get much in the way of a vote of confidence from college presidents. Only one-quarter (24%) say that, if given a choice, they would prefer that most faculty members at their institution be tenured. About seven-in-ten say they would prefer that most faculty members be on either annual (38%) or long-term (31%) contracts. Tenure is more popular among heads of public four- year institutions (50% say it is their preferred option for most faculty members) than among heads of private four-year institutions (30%). There is very little support for tenure among heads of public two-year colleges (11%) or for-profit colleges (4%). Heads of For-Profit Colleges the Most Downbeat. The for-profit sector of the higher education system has been growing rapidly in recent years, and its leaders have a downbeat point of view on many issues covered in the survey. A majority of them, compared with a minority of other college presidents, say the U.S. higher education system is heading in the wrong direction and that colleges offer less value for the money spent than they did 10 years ago. They are more likely than other presidents to say public high schools are doing a worse job of preparing students for college now than they did 10 years ago. Also, heads of for-profit schools are more likely than other presidents to endorse a workplace-related mission for higher education, rather than a goal of promoting intellectual growth or responsible citizenship. Public Has Split Views about Mission of Higher Education. By a small but statistically significant margin, the public says that the main purpose of a college education should be to teach work-related skills and knowledge (47%) rather than to help an individual grow personally and intellectually (39%). An additional 12% volunteer that these missions are of equal importance. College graduates tend to place more emphasis on personal and intellectual growth (52%) over career preparation (35%), while those who are not college graduates lean the other way, emphasizing career preparation (51%) over personal growth (34%). Most Graduates Say College Was Very Useful on Key Goals. Among college graduates in the survey, 74% say their college education was very useful in helping them increase their knowledge and grow intellectually; 69% say it was very useful in helping them grow and mature as a person; and 55% say it was very useful in helping them prepare for a job or career. Presidents See Multiple Missions for College… College presidents are evenly divided about the main role colleges play in the lives of their students; about half (51%) say it is to help them grow intellectually and mature as a person; while 48% say it is to provide skills, knowledge and training to help them succeed in the working world. These views differ by institution type. Seven-in-ten heads of four-year public and private colleges emphasize intellectual and personal growth, while about two-thirds of the heads of two-year and for-profit colleges emphasize career preparation. When asked about the most important roles that colleges play in the broader society, the presidents cite preparing students to become productive members of the workforce (40%) and responsible citizens (28%), and to ensure that all qualified students have equal access to a college education (21%). …And Say Academic Programs Are the Key to Attracting Students. When asked to name the most important factor in their competition with other institutions to attract students, 50% of presidents say it is the strength of their academic programs, far ahead of other factors such as flexibility of academic scheduling (15%); tuition and fees (14%); quality of the faculty (8%); campus location and student amenities (7%); and quality of student life (3%). For Most of Public, Character Trumps College. Respondents to the public survey were asked to assess how important four different character traits or personal experiences are to a young person’s success in life. Nearly all (96%) say a good work ethic is extremely or very important; 93% say that about knowing how to get along with people; and 90% say that about work skills learned on the job. Just 77% say that a college education is extremely or very important. Looking at the demographic patterns in these responses, blacks in general—and black women in particular—are more likely than other groups to see a college education as extremely important to success in life. Nearly All Parents Expect their Child to Go to College… Fully 94% of survey respondents who have at least one child under age 18 say they expect that child to attend college. Just over half (53%) of these parents say they’re saving to pay for their child’s education, though of this group, about half say they’re not saving enough. … But Most Young Adults Don’t, Typically for Financial Reasons. Even with the steady rise in recent decades in college enrollment levels, the majority of young adults in this country do not attend a four-year college.3 And the main reasons, according to the Pew Research survey, are financial. Among survey respondents ages 18 to 34 who do not have a bachelor’s degree and aren’t currently enrolled in school, fully two-thirds say that a major reason they did not continue their education is their need to support their family. Some 57% say they would rather work and make money, and 48% say they can’t afford a college education. One-third (34%) say they don’t feel they needed more education, and just 5% say they didn’t continue because they weren’t accepted at the school they wanted to attend. The remainder of this report is organized as follows: Chapter 2 provides a look at long-term trends on college enrollment, cost and student debt, based on data from the U.S. Census Bureau, the U.S. Department of Education and other official sources. Chapter 3 provides a detailed look at the findings of the Pew Research survey of the general public. Chapter 4 provides a detailed look at findings from the Pew Research/Chronicle of Higher Education survey of college presidents. Chapter 5 provides a Pew Research estimate of the lifetime “payoff” of a college education that weighs the cost and foregone earnings a student incurs while in college against the added earning power that comes with a college degree.